The Gooseberry trip didn't happen so plan B was to get a good tour in on Saturday. And by good I mean something bigger and cooler than we normally do. I met Dug, Mark, Rob (not his real name either), Jon and Mike at the base of LCC at 5:30am. We skinned up Cardiff to Poleline and then made our way along the ridge to the "black knob". Something about climbing in the dark makes it less painful. From there we skinned/booted to the top of Superior via the ridge. That ridge makes me want to swap out my plastic soles and go back to the rubber boot sole. Once at the summit of Superior, we dropped into the north facing shots of Cardiac. The snow was so good, we had to lap it. After two very good shots in Cardiac we made our way back over to the little superior ridge and skied it out to the road. Thanks Jon for the pics! I'm not sure why it has taken me so long to set this up but I finally did. Anyone who visits my blog is aware of what Fatty is engaged in. Please help Susan fight by donating. Met with a few guys in marketing & finance yesterday to discuss the 09 cycling team at work. What started out as a small group of less than 10 riders 2 years ago, has evolved into a machine of 70-100 riders (not all local but still. That's a pretty good number). We put together a solid budget to help cover the costs of the kits, event registrations, misc apparel and give aways. It's now being floated around upstairs w/ the Executive Team for approval. 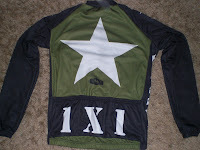 If we can pull this off, it will mean a full team kit (bibs, jersey, arm warmers, knee warmers, socks & bottles). It will also mean the ability to exepense some of the local races. But what really gets me excited is my lunch rides have turned into "training for the work cycling team". 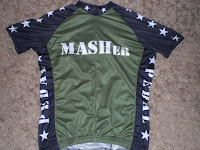 All I have to do is make sure I wear the jersey and all of a sudden, i'm the good Corp citizen by riding during lunch. Next year I'm asking for some bike frames. I've been doing the occasional spin class at the local gym during the winter months. I never know what to wear when I spin. 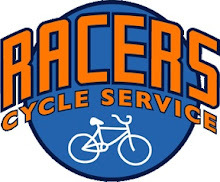 I've tried everything from lycra bib shorts & jersey (careful to never wear the matching kit), baggy mtb shorts w/ a jersey, cut off khakis w/ a t-shirt, cut off khakis with a jersey (so far this is my favorite). The problem is the room gets so hot that I sweat like a pig. the lycra & jersey combo makes the most sense and is the most comfortable, but I hate walking in like I'm trying to be a pro racer. Last week I wore lycra and jersey and 3 people in the room asked if I "raced". I was way to embarrassed to answer that question. baggies are too hot and khaki shorts leave a noticable sweat ring in the crotch area. And then there is the issue of what to wear in route to the spin class. I don't own any sort of sweat or work out pants. So far my messenger knickers do the trick but I get a lot of looks from the meat head weight lifters. I'm not a fan of the gym. It probably boils down to the fact that I don't like people. There. I said it. This mornings dawn patrol can be described as "Cold Smoke". It was freezing but the snow was some of the best of the year. Rob captured this pic from his cell phone. Getting to the top just as the sun was rising. The low quality video makes it look like BigFoot or maybe the Chupacabra. Both are real. When I was a kid, this was the best ski movie ever made. In fact, to this day, I still consider it the queen of all ski movies. I found this on DVD on Netflix.com and have it on order. I'm anxious to see if it's as good as I remember. I'm gonna have a Blizzard of AAHH's ski movie party at the house when it arrives. Drop me a line if you are interested. That's what I've been asking people around the office today to help w/ the pain. Rachelle took me on a "run" on Monday. I haven't run more than 100 ft in like 10 years so I kinda expected some soreness. I just didn't expect my calf muscles to rip off the bone. We ran for about an hour and a 15 min on the trails around Corner Canyon. I felt fine yesterday and a little sore this morning but as the day has gone on, I'm feeling it more and more. I'm a loser. I need to mix up my training more. I think running one day a week will help me get back in riding form before March. 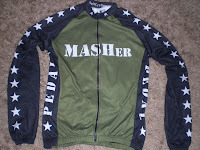 I also did a very small run of winter weight long sleeve jerseys. I only have size large available. First come first served. Price is $75. I can't wait to get these dirty. 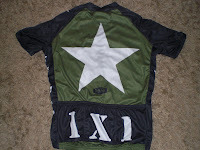 I recently posted an ad on MTBR.com to sell some jerseys. I'm happy to report that my return on this $2.00 ad has been great until last night when I got this question from a prospective buyer. Is it me or does this seem a little fishy? So as soon as you get the check you all you need to do is that cash the check same day and deduct your item fee and send the rest funds to the shipping Company Agent Through Western Union, So that they can come for the pick up of the item as soon as possible.. Please kindly answer the few questions Accordingly. Will you be able to cash the check same day? How can i trust you with rest funds.? Please if you are okay by this get back to me with you full name and address,city,state,code,tel number .. I am ecstatics with your offer. Thank you very muches for taking interested in my goods and/or products. I should like to make such a deals. My name, address, resting heart rate, zodiac sign, and all my other personal and vital informations are below. This is for you to do: place check along with your shoes in a bocks and send it upon when you shall receive this communicationale vehicle. You must go now to do these as I will not much longer live in this house. I'm very lucky to have a wife who likes the mountains as much as I do. With the holidays and end of year craziness over, we are finally able to celebrate our anniversary. We didn't get a fancy hotel or travel to some exotic place. Instead, we begged our family members to watch our kids for a couple of days so we could spend some time together. Skiing, movies, food...whatever we want. Day 1- we hiked up Flagstaff (near Alta). We were treated to 10" of light dry snow. Breaking trail was brutal but we had the entire mountain to ourselves. Seriously. Not another soul in site. No other tracks. Very rare for a power day in Utah. Rachelle kept a strong pace the entire way. I've said this before, she can climb like the boys. After skiing, we hit the porcupine for some food. So good. I'm losing fitness by the day. By now I'm usually in a routine of early morning spin or backcountry at least 3-4 days a week. This year, I have yet to find that routine. I feel like the wheels are coming off. I'm in a tailspin. Not good. Does anyone know the best way to add resistance to a set of basic rollers? I've heard placing a rolled up towel under the rear roller will do the trick but it seems like a great way to catch the house on fire. Got up early and met 6 other guys for some dawn patrol in the wasatch backcountry. 6 out of the 7 of us in the group are cyclists. Climbing mountains in the winter is about as close to mountain biking as it gets. The lungs burn, the legs get worked. A lot of suffering is required to earn the downhill. You would think that any cyclist could maintain good form and transition to backcountry and be fast. But here is the thing. Ben, the only non-cyclist in the group, is and always will be the fastest climber. It's weird. I have no idea how he maintains his fitness over the Summer/Fall months. He was able to put significant distance between all of us without coming close to redlining it. The guy is a freak. At one point, I managed to catch up to him or at least within talking range and ask how he stays so fit. His reply was disturbing. "I sit around and eat crap". The thing is, he wasn't joking. In fact, at the top of the first lap, he busted out a baggie of chocolate chip cookies. It was 7:30am and he was sugar loading on cookies. I've joked about giving him a road bike and making him time trial up Suncrest to see what time he could post. I wouldn't be surprised if he could break 20 min on his first try (north side). This spring, as soon as the road is dry, I'm going to do that. I must know what he can do on the bike. Genetics go a long way I guess. Some have it. Some not so much. Plan A was to ski. That didn't happen. Plan B was to meet up with the soccer moms and spin at the local gym. I decided against that. Plan C was to bust out the rollers. You know what makes 40 min on the rollers tolerable? Fugazi. That's what. For those of you who have never tried rollers, I captured a portion of my session on film. Notice how narrow these things are. You can't drift too much any either direction without paying for it.